As Shadowhunters nears the close of its second season, we’re gearing up for a seriously intense and emotional season finale that’s sure to shake things up for the show and these characters moving forward. 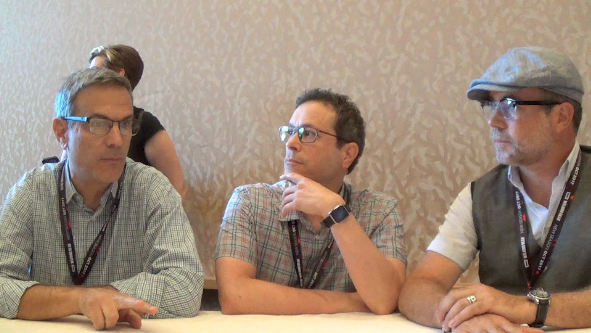 We spoke with Shadowhunters executive producers Todd Slavkin, Darren Swimmer, and Matt Hastings at San Diego Comic-Con earlier this month, where they previewed the killer season finale and discussed balancing the wants of book fans and the show fans. Following a jaw-dropping trailer that debuted at Comic-Con, there’s obviously a lot of huge storylines coming up as we wind down this second season. While we tried to get some finale scoop out of the producers, we didn’t get a lot, but we got the promise of City of Glass. One of the biggest pitfalls of Shadowhunters has been the divide between the book fans and the show fans. Book fans are coming into this show expecting to see the story they fell in love with – the essence of it – honored while show fans are going of what only the show is giving them. It’s definitely been a controversial topic since the show debuted, but the producers say that they’re honoring Cassandra Clare’s books. Stay tuned for more Shadowhunters interviews from SDCC! I lost interest in the TV series early on when the actor chosen to portray Luke was nothing like the character described in the books. The final straw was Valentine’s thuggish physical appearance and setting his diabolical experiments at Chenobyl!!!!!!! The addition of made up characters in ways that diverged from the original plot may have been creatively satisfying, but the violence it did to the basic story left me cold. Keep writing Cassie. I have a vivid imagination and can visualize the scenes for myself.